I have a lovely Toshiba laptop that proved too heavy for KM’s travel needs, and I got it when he got himself a lighter one…and for nearly 4 years, it has worked extremely well. This morning, I tried to shut it down when clicking on the Zone Alarm prompt made the screen hang…and that’s it. But even that has a good side to it…I got to meet a very interesting young man, who came to repair it; he is very interested in wildlife and trekking too, and we chatted and chatted and chatted away! His blog is at chandanv on Blogger. I am now on a borrowed laptop, so will visit his blog later…. I found me a blonde. I’m going SOUTH for the season.. The following people not on the friends list for deponti are “close to it” according to the metric that TrustFlow defines. Numbers represent distance; people listed earlier are closer than people listed later. It *must* be lonely at the top…. Just musing about excellence…and I must say, I am comfortable with being on the way there than being there (not likely in any field either! )…it’s so comfortable being among the million duffs all shambling along in amiable company at the bottom, comparing mistakes and making fresh ones each time, and being ecstatic during the times, by fluke, when one gets something right…how lonely it must be to be at the pinnacle of perfection, the object of envy (or worse, jealousy), not knowing if, having reached a peak, one can keep that up, or trying to deny the fact that the most likely way now is downwards….separated from one’s peers by the vast expanse of one’s achievement, bereft of any but the company (often competitive) of other stars whose egos are likely to make them tsars….I think this is one of the reasons why I like to learn new things all the time. There is such happiness in being a beginner, one has NO facade, no standards, to keep up or live up to, one can make the most ghastly mistakes and cheerfully own up to them! No, this is NOT a sour grapes post, either, oh you uncharitable people out there! I really do enjoy repeated duff-dom….learning and being a beginner keeps me…to use that awfully over-used phrase….young at heart. That’s what I want to call the antiquated, outdated, badly-designed-for-today’s-needs Bangalore Airport. The explosion of the airlines (er…am I using the right term?) has resulted in air travel being affordable to everyone….good. But it has also resulted in the Airports Authority (of Bangalore at least) being caught with their pants around their air-traffic ankles. The crowds are vast, traffic in the airport is chaotic, and announcements just cannot be heard across the cacaphony. We had someone bound for Delhi coming all the way to the boarding gate…we were bound for Mumbai. He ran …no….streaked back the way he had come, hoping to be able to catch his flight. The only thing that seems to have happened is that one pays Rs 30 for a half-awful-plastic-cup of coffee (“Madam! That is not even a dollar!” said the vendor when I protested. What IS our national currency now?) and proportionally high prices for everything else at the supposedly-glamorous coffee shops. Yeuggh. Parking fees are Rs.50 onwards. Last week a friend lost his windshield wipers too. The Devanahalli Airport has been on the cards and the planners’ blueprints for about 15 years now. If the Tirupati airport can be named after Venkatachalapathy, the ruling deity of the area, then surely the Devanahalli airport should be named after Apathy, the ruling deity of Bangalore Mahanagara Palike. Oh I HATE the politics that puts its fingers in the pie of progress. Couldn’t we send our airport planners on a one-way flight to the Indian Ocean? I went to pick up KM and the other executives from the factory and whiled away my time, while they debated weighty corporate matters, by roaming around the factory campus. Apart from the pictures of the CRIMSON ROSE BUTTERFLY and the RED-VENTED BULBUL that I have already posted, I saw lots of GREEN BEE-EATERS, PURPLE-RUMPED SUNBIRDS, and the usual MYNAHS, BLACK KITES (less in numbers because we were far away from a city). 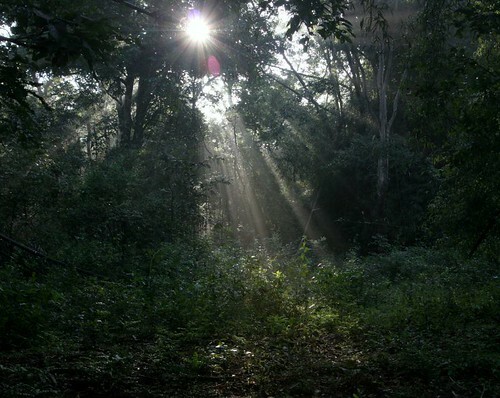 We reached Dandeli too late for the evening safari, but met Mr Basil, one of the naturalists there, who told me about a sighting of a BLACK PANTHER a few days ago. (Of course these animals are always sighted before or after my stay.) The corporate group had a musical evening but I retired early because my focus was the morning safari! Thankfully, they were not too noisy, and it was peaceful on the banks of the Kali river. And the side view, too…photographing butterflies is hard, frustrating WORK! 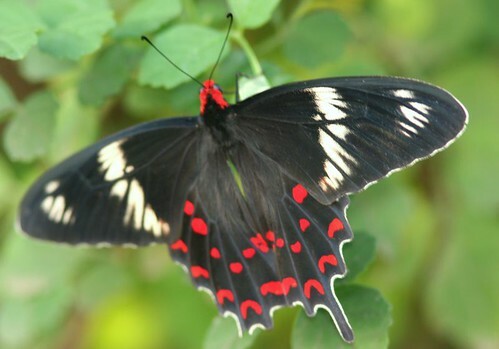 Butterfly…the name is a corruption of “Flutterby”, which was what they were called, with good reason! You aim your camera…you steady it…..you alMOST click…and the thing has….fluttered by! Wait for more pictures from the Dandeli trip….. If anyone thinks traffic in Bangalore is bad, they should try travelling by car in Mumbai. We are staying in the Peddar Road area, the wedding we wanted to attend was at Chembur, and we visited someone at Andheri….neither of us wants to go back for the reception now! I went to the company where KM consults, and the whole group was to leave for JLR, Dandeli. While waiting for them, I went around the campus and found several BEE-EATERS, RED-WHISKERED BULBULS, PURPLE SUNBIRDS, ROCK PIGEONS, and other such common birds all over. 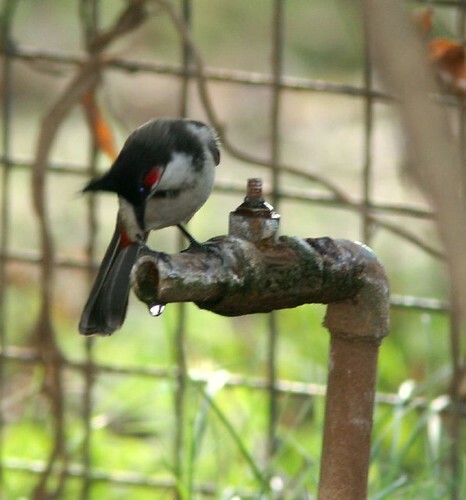 I saw this fellow try to have a drink from a slightly leaky tap…and I couldn’t resist clicking! 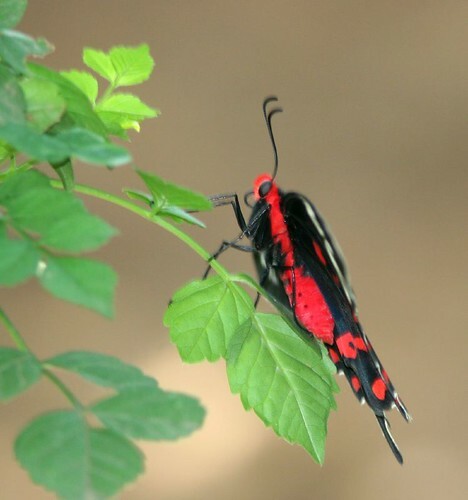 Will post the rest of the pics soon….I took several of butterflies, dragonflies, wasps and ants…fascinating creatures! You are currently browsing the Deponti to the world blog archives for November, 2006.